Happy Friday! We have 34 images of the Blues House, 401-403 South Kent Street, to share this week, with images taken during the clean up, porch rebuilding, and interior wall and foundation work. Catch them all at the top of the Flickr photostream, or the end of the Revolving Fund or Kent Street albums. Continuing with our work making sure all our baseline photos for the Revolving Fund houses are digitized, we added 33 photos to Flickr this week, including 21 East Germain, 312-314 North Kent, 208-210 North Kent, and the 300 block of South Kent Street. Be sure to catch them at the top of the photostream, or the end of the Revolving Fund album. Do you have ideas for new walking (or possibly biking or driving) tour themes in Winchester? Let us know what you would like to see covered – themes, areas of town, architectural styles or something else. Through discussions with the PHW Board of Directors, we would like to expand our offerings outside of the core downtown around the Loudoun Street Mall and highlight lesser-known history and architecture. Drop your ideas off at phwinc.org@gmail.com, 540-667-3577, or at 530 Amherst Street, Winchester, VA 22601. We are in very early planning phases, so all brainstorming ideas are appreciated! This week we added 38 photos to our Flickr account from our ongoing spring cleaning of the Revolving Fund file cabinet. This is likely the last cabinet to have a significant amount of photos that have not yet been digitized – but never fear, we still have at least a few more weeks of Friday Photos featuring older images to come, as we have four 35mm slide trays with old presentations to digitize. Many of today’s photos are our “baseline documentation,” the images taken shortly before or after PHW purchased the properties, or are pictures of work in progress during the first rehabilitation. This batch covers 124 and 125 E. Clifford, 112-114 E. Cecil (the chicken coop house), 106-108 W. Cecil, 119 S. East Lane (the Gibson house), and 706 South Cameron Street. If you have seen PHW presentations on the Revolving Fund in the past, you might recognize some of these images, but it did not appear that they made the jump from a PowerPoint program to Flickr. You can catch all the new additions at the top of the photostream or at the end of the Revolving Fund album. Happy viewing! This week we revisit one of the largest undertakings in the history of PHW’s photo digitization project: The Grim-Moore House album. 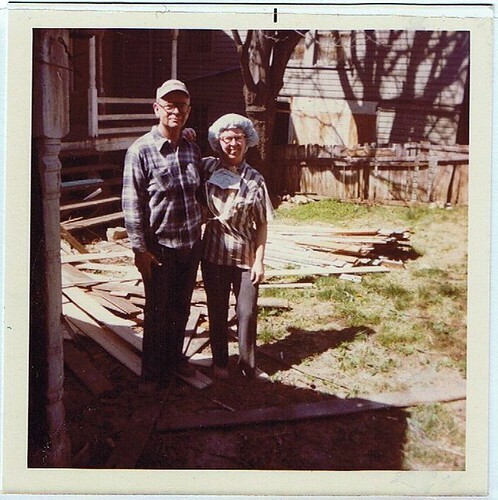 This set is nearly 550 photos taken between 1977-1982 by Virginia Miller during the renovation of this Jennings Revolving Fund house. 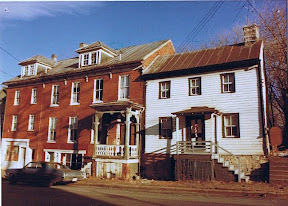 The Millers documented almost every step they took to save the log and brick houses at 510 and 512 South Loudoun Street, from the initial walkthrough still showing the deplorable living conditions in the apartments, the Victorian details they removed to return the building to something closer to its appearance in the early 1800s, to their documentation of a building too far gone to save, and even a surprise setback when part of the foundation crumbled mid-rehabilitation. The album passed on to the new owners, Joe and Sharon Collette, and was digitized in preparation for a small PHW gathering in the home before the Collettes made some cosmetic updates and opened the house for the 2014 Holiday House Tour. Part of what made this album both informative and challenging was Virginia Miller’s notes on the back of the photos. Her captions were extensive enough to date and explain what and where the photos were taken, but also rather idiosyncratic, making the transcription process involved. You may see in some of the captions a few unknown words or seemingly nonsensical sentences. The notes were transcribed to the best of our ability, and during the transfer from Picasa to Flicker a few typos and words were corrected. As we noted when this album was first posted, “[t]his is a fascinating and telling example of how PHW’s Revolving Fund can save ‘junky’ properties from neglect and almost certain demolition and restore them to contributing structures in the Historic District.” If you missed it, only caught a portion of the slides during the Holiday House Tour, or just want to page through some amazing before and after photos, this album should keep you occupied this weekend. What Is a Revolving Fund and Does It Impact Me? You may have heard of the Jennings Revolving Fund or Revolving Fund properties associated with Preservation of Historic Winchester, but you may not know exactly what that is and how that is different from the Historic District zoning and the Board of Architectural Review. Today, we’ll take a brief look at what revolving funds are and how they impact you. What is a Revolving Fund? At its most basic level, a historic preservation revolving fund is a pool of money which is used in some manner (purchases or loans) to buy or make improvements to a property. The money from those improvements “revolves” back into the fund either at the sale of the property to a new owner who will complete renovations or through repayments of the loans for renovation costs. The fund can then be used again and again to repeat the process. The goal of the fund is not to make money by itself – although that can happen – but to give an endangered property the time or money boost needed to enact a preservation plan. In almost all cases revolving funds lose money through the expenditures necessary to buy, sell, and restore property. This financial loss is offset by the retention of important architectural and cultural resources, and the fund is financially replenished through gifts, pledges, and fundraising events. Historic Charleston Foundation began what was likely the first historic preservation revolving fund in 1957 following their successful fundraising efforts to purchase the Nathaniel Russell house. 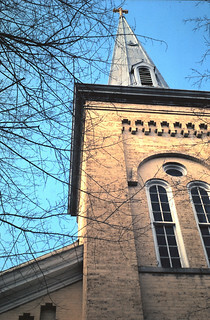 The goal was to raise $100,000 to be used toward purchasing residential property in a concentrated area and to make facade improvements to tempt buyers to complete the renovation, with supporting goals of occasional commercial purchases, acquisitions for rental, and selective demolition of noncontributing elements in the historic district. The objective was not to buy and hold property in perpetuity to turn it all into museums or to pick select individual properties scattered about a large area, but to make concerted, organized efforts to improve one area of Charleston with the most effective and visible use of their funds. Aside from bequests, property gifts, and pledges, Historic Charleston Foundation used historic house tours to generate income. Historic Savannah Foundation also found itself beginning a revolving fund almost by accident in 1959, when at the last moment Leopold Adler, II managed to negotiate a price for the land, then the bricks of the just-demolished carriage houses, then a price for the “standing” bricks in the Marshall Row houses. The main innovation of the Historic Savannah Foundation was to survey the city’s architecture, key it to Sanborn Maps, and determine the economic and cultural value of the historic buildings. Pittsburgh History & Landmarks Foundation began a revolving fund as part of their efforts in 1966. 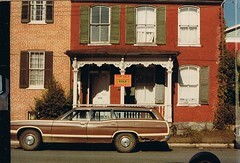 Pittsburgh’s angle was to rely on the architecture and history of the houses to help sell their need for preservation. A special focus was placed on turning around the Mexican War Streets area, which was rife with slum lords, overcrowding, and long-term residents fleeing the neighborhood because of the deteriorating conditions. The revolving fund was used to purchase property from the slum lords, stabilize the neighborhoods, and bring in a younger population as well as slowing the exodus of longtime residents. 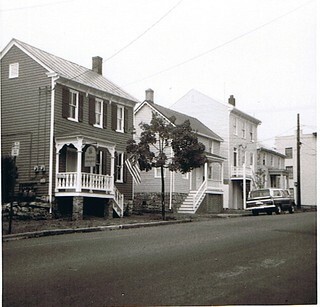 As overcrowding was a serious issue, part of the revolving fund’s mission in Pittsburgh was to provide assistance in relocating or subsidizing rents for low income tenants. Ray Jennings introduced the idea of a revolving fund to PHW during his brief but vital period in Winchester. Modeled on the programs in Charleston, Savannah, and Pittsburgh, PHW primarily used the revolving fund to purchase very early log structures around the downtown that were threatened with demolition or severe neglect. 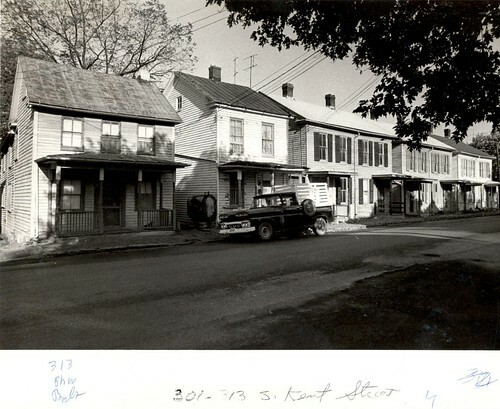 South Loudoun Street was picked as the target area for its concentration of early log homes, its visibility, its vulnerability to demolition, and because of the truly appalling living conditions in many of these single family houses that had been converted to multiple apartments. 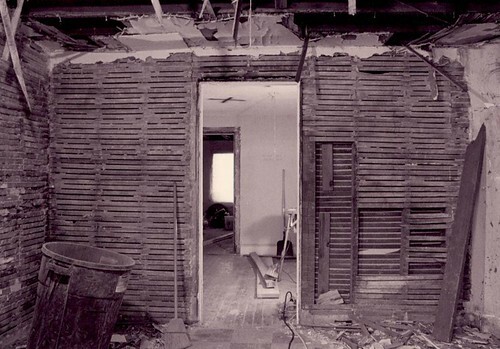 Like the example programs, work was concentrated on the exterior of the building to maximize visibility and investment, like the selective demolition at the Simon Lauck House to reveal the log construction under the Victorian-era additions. The architectural survey of 1976 was led in part by the same professor who had led the Savannah inventory, with one of the goals being to use the survey to identify potential revolving fund purchases. In the sale of the homes, their architectural features and history, and later tax incentive opportunities, were used in the marketing as selling points. Instead of using photographs, artists created line drawings of the properties for the sale flyers to spark a buyer’s imagination. To make sure the houses were sold to owners who would renovate and not demolish the structures, protective covenants were added to the deeds. In general the covenants pertain to the exterior appearance and upkeep of the properties, as well as a provision that PHW be notified with a right of first refusal when the property came up for sale again in the future. To date approximately 80 properties have either been bought and resold or had covenants voluntarily donated to PHW. The majority of these properties are within the Winchester Historic District, with a few just outside the boundaries, and one property in Frederick County. How can I tell if my property has protective covenants held by PHW? All of the properties with oversight by PHW and their matching deeds with the covenants listed are available online at PHW’s website, listed by street. What if my property has protective covenants held by PHW? There are two main obligations for all such properties. The first is that, like properties in the Winchester Historic District which are subject to Board of Architectural Review approval, PHW requires a sign off on exterior changes to the property (such as additions, demolitions, replacement materials, and paint colors) before changes are made. Certain buildings have similar restrictions on interior features like doors, trim, mantels, or floorboards of exceptional significance to the home. The second obligation is that during certain property transfers, PHW holds a “right of first refusal.” In general, this requirement is satisfied by the seller or the real estate agent contacting PHW with the asking price for the property. PHW will prepare a form letter to note PHW will not exercise the right of first refusal for the transaction. Depending on your legal requirements, PHW may also be included as an additional signer on the deed, or notarized forms or addenda may be filed with the deed. What kind of information do I need to submit to PHW to make exterior changes to a property with protective covenants? Because almost all of the properties with covenants held by PHW are also subject to the same review process as the Board of Architectural Review, we suggest you simply submit an additional copy of the same materials you prepared for your BAR application to PHW with a cover letter stating your intentions. You may bring larger documents to the PHW office at 530 Amherst Street or email all your material to phwi@verizon.net (maximum per-email size limit is 20 MB). Requests for exterior changes are reviewed as they are received by a committee of PHW board members. I have other questions or need PHW to sign off on a right of first refusal; whom do I contact? The PHW office may be reached at (540) 667-3577 or phwi@verizon.net. 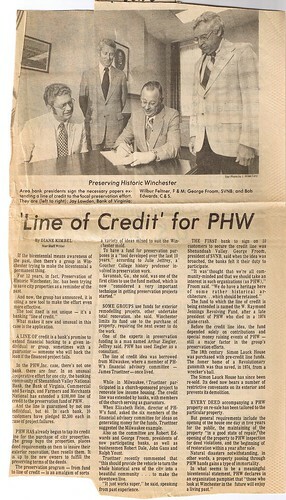 In general, a member of the PHW board is required by the protective covenants to sign on behalf of PHW. Please allow for one to two days to arrange for a PHW representative as a signer. Information on the history of the three early historic preservation revolving funds taken from Revolving Funds for Historic Preservation by Arthur P. Ziegler, Jr. et al. Happy Friday! No history post this week as we continue to work on the 50th Anniversary Party coming up on Sept. 19, but we do have a new themed album at Flickr featuring architectural details. If you’ve ever wanted to see examples of adzed vs. circular sawed wood marks, nail types, or visual examples of architectural terms, this album should help you out. More photos will be added to this album as time goes on, so check back! There are also new albums for the former Sacred Heart Church on South Loudoun Street, the Kurtz Building, and the Hexagon House. Images were also added to PHW’s Revolving Fund Houses album. In addition, some photos have not yet been categorized, so check out the photostream to see what else we found in our closet this week. The properties were held for many years by two families. 601 and 603-605 S. Cameron were both built by James A. Fuller, a Winchester railroad engineer. 601 was constructed in 1846, and 603-605 in 1882 (though like 215 S. Loudoun, deed references indicate there may have been an earlier dwelling on the site which did not survive.) These properties remained in the Fuller family until 1946. The interesting story may be the house at 607 S. Cameron. The Funk-owned house here had been destroyed by fire in the 1920s. Although offered as a rare chance for new construction in the Historic District, the lot instead became a once in a lifetime chance to move a historic property from outside the district into its boundary. The house is recorded in PHW’s notes as originating from 901 S. Cameron St., approximately the juncture of Millwood Avenue/Gerrard Street and Cameron Street. Presumably this house was in danger of demolition for the strip mall now located at 101-113 Millwood Ave., which was constructed circa 1983. 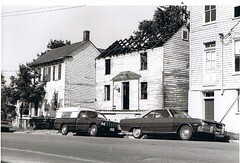 The May 1984 PHW newsletter notes this house was “laying on its side, under a black tarp” before the reconstruction process began. See more images of the Funk and Fuller properties at the Flickr album. 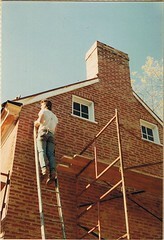 Although the organization had attempted to acquire property for hands-on preservation through the 1960s and early 1970s, no purchases resulted from the attempts. That was to change in 1974 with the creation of the W. Raymond Jennings Revolving Fund. Ray Jennings, mentioned previously as one of the best advocates for Winchester’s rich architectural heritage in the Feb. 7 post, was also one of the strongest advocates for the revolving fund idea in Winchester. (1) Such a fund’s purpose in a preservation-oriented organization would be to purchase, protect with covenants, and resell endangered property to new owners willing to undertake the renovation. Because of his experience traveling to other cities to learn from their preservation efforts, Ray Jennings had seen revolving funds in action and knew they could be powerful tools for historic preservation. Throughout his time in Winchester, he had worked tirelessly to see a revolving fund become a reality. Educational efforts (which will be covered more in depth in later posts) were launched in conjunction with the revolving fund in order to increase the awareness for the need to preserve our historic buildings. Speakers from major cities were brought in to conduct workshops and lectures on the revolving funds of Charleston, Savannah, Fredericksburg, and Pittsburgh. (5)(6)(7)(8) For the first time, PHW officially had an office to dedicate to these activities in the south wing of Betsy Helm’s home. The news was devastating, but also served as a galvanizing force for PHW to succeed in the task of starting a revolving fund. Ray’s wife LouAnne requested that in lieu of memorials, donations should be made to PHW; the funds were put aside for the revolving fund. And most importantly, the fund itself was named in his honor so that we could all remember the good work he did during his four years in Winchester. His legacy is reflected in the nearly 80 properties overseen through the Jennings Revolving Fund, which keeps the memory and idealism of his activism alive and well forty years later. Next week, we will learn about the all-important first revolving fund project – the Simon Lauck house on South Loudoun Street. Information on the creation of the Jennings Revolving Fund in this post collected from oral history and unpublished speeches provided by Betsy Helm. Friday Photos returns this week with a look back at a massive renovation project at 510-512 South Loudoun Street. 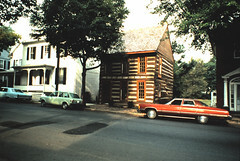 The building, known as the Grim-Moore House, is comprised of a log building circa 1760 and a brick building circa 1795-96. The house was purchased by Preservation of Historic Winchester through the Jennings Revolving Fund in 1975. At the time of the purchase, the once grand Federal-style home had been subdivided into multiple apartments, resulting in truly horrific living conditions. Bill and Virginia Miller purchased the property from PHW and worked diligently from 1976-1982 to restore the home to its original splendor. Virginia Miller documented the process in over 500 photographs and captions. PHW was fortunate enough to be allowed to scan and transcribe the notes from this scrapbook, and now we can share them with you. 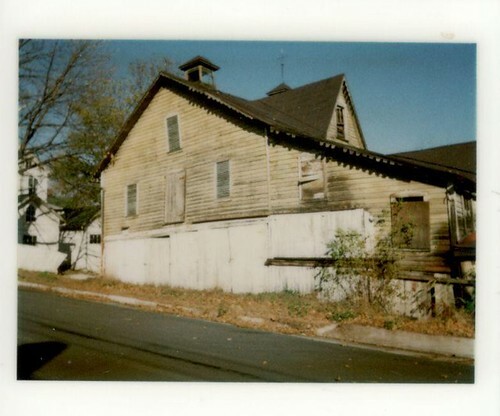 This is a fascinating and telling example of how PHW’s Revolving Fund can save “junky” properties from neglect and almost certain demolition and restore them to contributing structures in the Historic District. We hope you take some time this Apple Blossom weekend to remind yourself that this is what PHW is all about. Fun trivia: Did you know some of the PHW Revolving Fund properties were once likely given as a Valentine’s Day present from a husband to his wife? 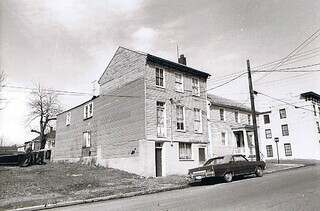 On February 14, 1951 Joseph Hodgson “in consideration of natural love and affection” granted his wife Irene Virginia Hodgson joint ownership of five properties, including 219 South Kent Street (pictured), for the rest of “their joint lives,” as well as granting the survivor absolute ownership in the event that one spouse predeceased the other. The other Hodgson properties include three more Revolving Fund properties, 211 South Kent, 124 East Clifford, and 125 East Clifford. Thanks to our former intern Mike St. Jacques for uncovering this piece of history for us!